MUMBAI, 17th DECEMBER 2018: Celebrate this joyous season with festive favorites and cheerful memories at The Westin Mumbai Garden City. Offering a menu of sorts, the exquisite dining outlets are serving up a variety of curated feasts. Join in as they rejoice in the holiday season with an array of festive events and delights. This Christmas eve, feast to your heart’s content as tradition meets excellence at The Westin Mumbai Garden City’s exceptional restaurants. 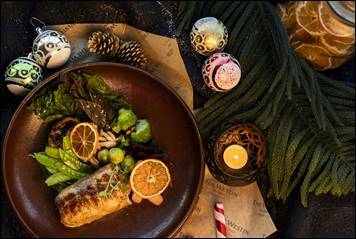 Relish a sumptuous Christmas meal with loved ones and lively music at Seasonal Tastes, our signature restaurant with an expert focus on International cuisine. Featuring an extensive spread paired with traditional Christmas favorites like Minced Pie and Truffle Roast Turkey coupled with Christmas Cocktails, Mulled Wines, classic Eggnog and much more. If you are in mood for some Italian cuisine, savor decadent delicacies offered at Prego our authentic Italian restaurant. Join in the Christmas Cheer and have yourself a very merry Christmas Eve! Have a holly, jolly and very luxe Christmas Day at The Westin Mumbai Garden City. A bountiful buffet and unlimited pour of the finest liquor awaits one and all. The menu displays a multitude of festive favourites like scrumptious Lamb Osso Bucco with Saffron Risotto and Gremolata, Maple and Pomegranate glazed Gammon Ham, special Christmas Pudding and much more. Alluring live counters and Christmas cocktail concoctions will show guests a very merry and joyous time. Indulge in a night of splendor as you sail into the New Year with a picturesque view from the 18th floor or from an authentic Italian Dinner. A lavish New Year’s Eve Dinner with unlimited liquor put together at Level 18 and at Prego will entice every palate. Savor Christmas delights from live counters displayed across the entire 18th floor. Or dive into an authentic Italian feast as Prego serves up a storm of dishes. Bring in the New Year on a flavorful note and create the most unforgettable memories at The Westin Mumbai Garden City. This New Year, bring in the year luxuriously and be spoilt for choice with the extravagant brunch display at Seasonal Tastes. With abundant imported liquor and plenty palate pleasers from around the globe, the New Year will be welcomed with a bang of flavours. Devour mouth-watering festive favorites or enjoy treats from the luscious live counters across the 18th floor. Revel in the New Year with breathtaking ambience and a scrumptious spread at The Westin Mumbai Garden City. Westin Hotels & Resorts, a leader in wellness and hospitality for more than a decade, lives its philosophy “Empowering a Better You™” through the brand’s Six Pillars of Well-Being: Feel Well, Work Well, Move Well, Eat Well, Sleep Well and Play Well. At more than 200 hotels and resorts in nearly 40 countries and territories, guests can experience offerings that include the iconic Heavenly® Bed, RunWESTIN™ and Westin Gear Lending with New Balance®, delicious and nutritious SuperFoodsRx™ and more.